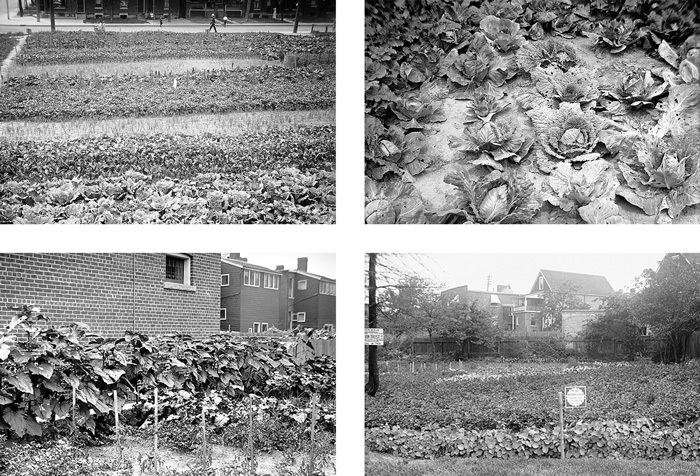 In the spring of 1915, The Vacant Lots Cultivation Association in conjuction with the Toronto Rotary Club established over 80 garden allotments across the City of Toronto in underutilized and vacant spaces. Below is an excerpt from an article from The Rotarian, Volume VII, No. 5 November 1915, describing the success of the project’s inaugural year. The accompanying photos, not appearing in the original publication, are located in the City of Toronto Archives. The Toronto Rotary Club has just published a comprehensive twelve-page report of their Vacant Lot Cultivation scheme successfully promoted during the past summer, and any Rotarian interested in receiving a copy can do so by addressing the Secretary of the Toronto, Ont., Rotary Club. The land donated by citizens for public use for this purpose was divided into approximately one-eighth acre lots. A supply of ten varieties of vegetable seeds, a peck of seed potatoes, two dozen tomato plants and fifty cabbage plants were furnished free with each allotment. The applicants to use the lots were selected and vouched for by various churches and social settlements. The applicants paid one dollar for all the privileges for the season, and agreed to be governed by rules of cultivation and care of the allotment. All gardens were numbered with a Rotary sign and an identification card was given each gardener bearing lot number and the name and address of the worker. The police and boy scouts were invited to co-operate in guarding the lots. The club paid for the ploughing, harrowing, seeds and necessary printed matter. The city supplied the water free. The club members gave their services free. The newspapers rendered great assistance in giving the work publicity, which was a big factor in getting land and applicants. On May 17th Sir John Willison planted the first potato at the ceremonial commencement of the work. By July 17th 600,000 square feet of ground were planted to vegetables, and nearly a mile of nasturtiums along the borders of the gardens was planted. Besides this area we have under cultivation eight acres adjoining the city, divided into one-acre market gardens. All the crops in the 130 lots go to the 462 men, women and children who cultivated them. Ninety-six families have written expressing their appreciation and hoping the work will be continued next year.